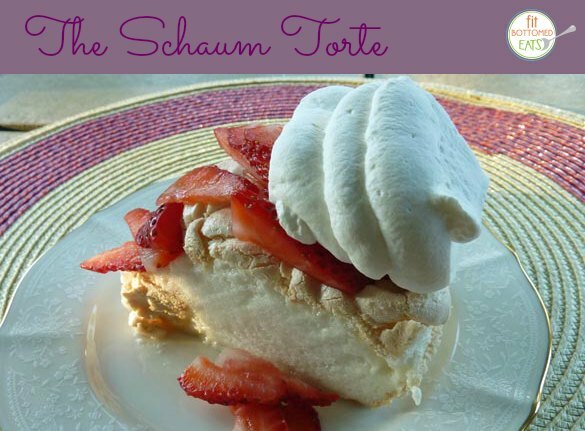 If you live outside of Milwaukee, chances are you’ve never heard of the Schaum Torte, so let me make the introductions. Fit Bottomed Eats reader, meet the ridiculously easy-to-make, low-fat, gluten-free, economical Schaum Torte. The Schaum: your make-ahead, impressive new BF. The Schaum (devotees have affectionately dropped the formal name) is a confection of German heritage made with only a few basic ingredients — egg whites, sugar, vinegar, cornstarch — that is topped with fresh strawberries and a dollop of sweetened cream. Crispy on the outside with a soft and chewy marshmallow-like center, it is the perfect light dessert. Similar in nature to the Australian Pavlova, the Schaum can be dolled up a multitude of ways, but loyal Milwaukeeans prefer the original toppings. The base of the Schaum is meringue, which can be a bit tricky. Here are a few pointers. Cold eggs are easier to separate than room-temperature eggs. Separate, but leave the whites out for a half hour before beating. Even a little yolk can spoil a meringue. Crack eggs in a separate bowl in case you break a yolk. Make sure your mixing bowl and beater is grease-free. Once you start to add the sugar, do so slowly. This ensures that the sugar is dissolved. It takes at least 6 minutes at high speed to create stiff, glossy peaks. And that is using a good stand mixer. If you are attempting this by hand … good luck and get on with your bad self! Glossy, stiff peaks will not droop or fall. Gorgeous! But it will fall as it cools; that’s the nature of the beast. The German Schaum Torte - literal translation foam cake. 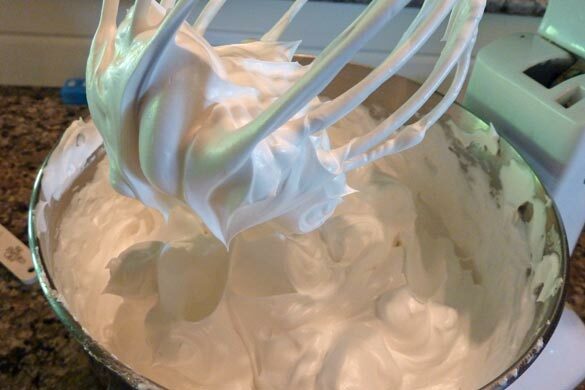 Place egg whites into the bowl of an electric mixer. Mix together cornstarch and sugar. Set aside. Add vinegar, vanilla and salt and beat on medium high speed until soft peaks begin to form. Turn mixer to high and continue to beat while slowly adding sugar a spoonful at a time. Beat until stiff, glossy peaks form. 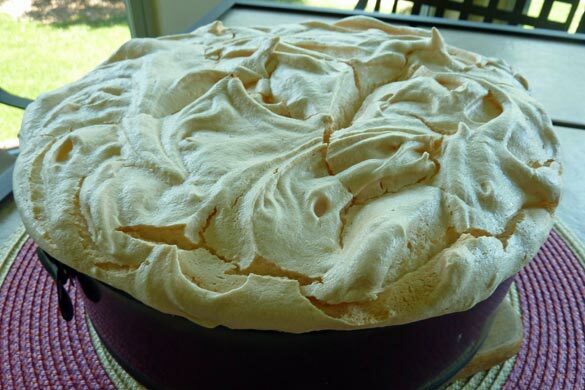 Spread meringue into a parchment-lined 9 or 10 inch springform pan. Bake for 1 hour until delicately browned and dry on top. Pour cold cream into a cold metal bowl. No springform pan? Mound the meringue onto a parchment lined baking sheet and spread to a 9 or 10” diameter. Or make individual tortes by spooning or piping meringue into 3 or 4-inch diameter. Bake for only 50 minutes. Individual schaum will be more crisp, and will keep in a sealed container on the counter for a week.